In recent years we have seen a growing number of software tools that support product manager in their day to day work. 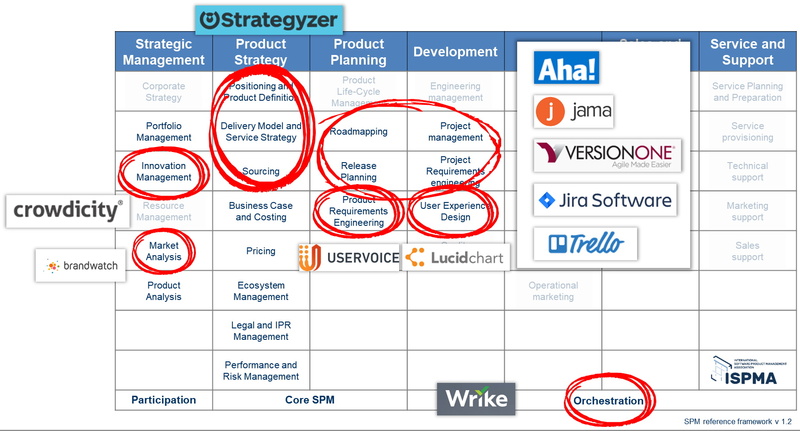 I have presented a talk about this tool landscape at the Software Product Summit – April 17-18, 2018 in Frankfurt, Germany. In order to address the entire landscape of tools for product managers it is helpful to look at tools from the perspective of activities that product managers perform in their job. This way we slice the broad list of tools into categories that are easier to analyze. As a basis I use the framework from the International Software Product Management association ISPMA. This is an activity-based framework that addresses the full scope of a product manager’s job: it includes not only the core activities that product managers must perform themselves, but also the important topic of working with a multitude of other functions, from Development to Service and Support. The columns in the framework represent typical functions of a software organization. 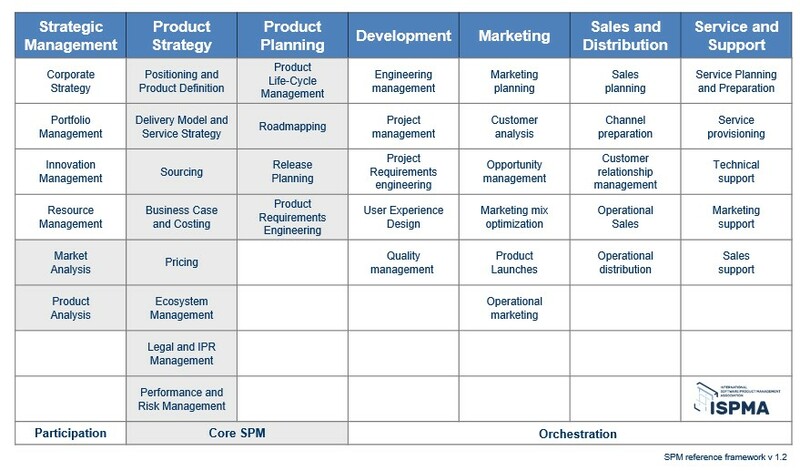 Core activities of Product Management are described in the grey columns for Product Strategy, Product Planning and Strategic Management. The tools displayed here are typical for those activities. Of course, they are not the only ones in that area and are selected by myself for illustration purposes. Note, that tools often support more than a single activity from the framework. For example, the agile planning tool VersionOne from CollabNet supports activities of product management and development. So, let me describe in a little more detail how tools support these different activities. Software product managers are typically expected to maintain an up-to-date picture of the market for their product, including a deep understanding of both established and emerging competitors (activity: Market Analysis). They are also expected to keep track on how their product is doing compared to plan, its strengths and weaknesses (activity: Product Analysis). Based on this in-depth understanding, software product managers often come across great innovation ideas that can either be applied to evolve the scope or positioning of their own existing product, but also ideas that could lead to new product ideas (activity: Innovation Management). These activities require handling a lot of information, discussing it with many different stakeholders, and keeping it all organized and current. In strategic management I see tool support in the area of innovation management. Crowdicity not only allows you to capture and discuss ideas within your company but also reach out externally to the community to get a much broader perspective. You may frame questions about problems looking for creative ideas how to address them. Various gamification aspects in Crowdicity help to engage users. Product managers can feed-in the best ideas from Crowdicity into the product planning process. Brandwatch is a powerful tool to monitor your own or your competitor’s product brands. It analyzes various data streams from social media like Twitter, Google or Facebook for brand appearances and generates real time visualizations about that data. Using Brandwatch product managers can measure the effect on marketing activities or product releases shortly after launch. Software product managers are responsible for defining and maintaining the strategy for their product. Key elements of a product strategy are target market, delivery model, product positioning. Usually product strategies are described in lengthy text documents. Through the use of tools product manager can visualize, analyze and communicate product strategy effectively. In 2008 Alexander Osterwalder published the business model canvas which is a strategic management and lean startup template for developing new or documenting existing business models. Since then the business model canvas has been applied successfully by numerous companies and evolved into variations for specific businesses. Strategyzer is a tool provided by the company of Alexander Osterwalder. It allows product managers to create and manage one or more business models. The advantage of using a tool instead of a whiteboard is that a product manager can include financial models, for example a model for the revenue forecast. By utilizing the Estimator in Strategyzer a product manager is able to explore different financial scenarios. Product planning translates the product vision and strategy into plans with associated actions. Product management seeks for tool support in product planning to establish, communicate and negotiate these plans with the various functions. You may read more about Aha! in my previous blog Aha! – More Than A Roadmapping Tool. Jama from Jama Software is referenced here as a representative for the class of requirements management tools. Requirements may be named differently in the project context: business requirements, system requirements, functional requirements, nonfunctional requirements, epics, user stories, and so on. A good requirements management tool must have the capability to freely configure the names used for requirements along with their company specific fields like priority, source, business value, effort, risk, and so on. With Jama you can configure the various requirement types and associate them for the projects. Product managers might be particularly interested to utilize higher-level planning requirement types like: goals, epics, themes, etc. For mobile use Jama provides their stream interface. It allows product managers to be informed about urgent issues, comment on it or even decide on immediate actions. If you’re interested on other top requirements management tools look up the comprehensive list on making-of-software.com. VersionOne is an agile product planning and monitoring tool created in 2002. In the early years it has focused on small agile development teams, but in the last couple of years VersionOne got a lot of new features to support agile enterprises. Product manager can combine high level planning information with detailed information on the story level. VersionOne is used in tight collaboration with development. The worldwide usage of Jira from Atlassian has grown to such an extent, that it is not sufficient to look at Jira alone but at the entire ecosystem around it. Within this ecosystem there are solutions not only for development but also for product management or quality assurance. I will have a detailed look at the Jira ecosystem for product managers in my next blog. Trello is a web-based project management application originally made by Fog Creek. In 2017 it was sold to Atlassian and is now part of the Atlassian software suite. Trello has a wide range of use scenarios, starting on the private side as a personal task manager. At the other end of the spectrum Trello can be used as a project management, roadmapping, or release planning tool. Trello now being part of Atlassian can be used as a lightweight front-end to Jira software. Getting feedback from real users about needed functionality is an extremely important activity of product management. UserVoice automates the collection of customer feedback and turns it into actionable data that can be used to drive strategic product decisions. By enriching feedback with quantitative data, product teams can prioritize feature development based on statistical analysis of customer traits and preferences, rather than solely relying on guesswork. User Experience (UX) is a key success factor for product success. UX hast to be addressed not only during development but also in the product planning phase. Sometimes product managers make use of prototyping or wireframing tools to illustrate product ideas to the development team. Lucidchart is one of the many tools in this category. It was launched in 2008 and has a rich set of features to quickly sketch out product ideas. Product managers are often expected to be „mini-CEOs“ for their products. According to ISPMA they are „responsible for managing software with the objective to achieve sustainable success over the life cycle of the software product“. To achieve that, product managers collaborate with and influence a wide range of stakeholders from both outside and inside their organization. To oversee the various activity streams performed from the different functions project management or portfolio management tools can help. There are quite some tools available in this category. I have picked Wrike as a modern example. The project management tool Wrike was first released in 2006 by the company Wrike in San Francisco. Similar to most tools mentioned in this blog Wrike is a SaaS only solution. It focuses on features for project management and collaboration. With it’s development process agnostic setup it is ideal for companies who have flexible and independent ways of working in different teams. Product managers can benefit from Wrike especially if all the various functions in the organizations are planning their product related activities and milestones in Wrike. In this blog I provided an overview on tool categories that product managers may benefit from. The chosen example products are based on my personal selection and mentioned here to illustrate their benefit for the category of tools they represent. Finally, I like to mention that some if not most of those tools are used by other functions in the organization as well. Therefore the decision about such tools is often not driven by product managers alone. For example if a specific tool is already in use by Development then product managers might consider the use of add-ons to support their own work instead of introducing yet another tool. Good collaboration with Development is more important than a perfect tool support for product managers. Such an approach will be discussed for the Jira ecosystem in my next blog within this series.